I think it's interesting that the woman seems to be dancing a Spanish gypsy dance in an Australian advertisement for a German brand. 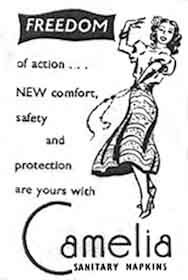 Does this ad use the common theme of tampons, freedom - but also safety, comfort and protection? Only odor is missing, a problem with pads and usually an advantage with tampons. Were tampons being introduced into Australia at this time and was this a reaction to that? Australians apparently didn't adopt the usual United-Kingdom term for pads, sanitary towel.